The Spanish giants have made the 25-year-old Wales star one of their prime transfer targets for the summer. They updated their expanding dossier on the talented Gunner during Wednesday night’s exciting 3-3 draw at Liverpool. Now they believe Ramsey will join his Wales team-mate Gareth Bale in La Liga next season. Barcelona attempted to land the former Cardiff attacking midfielder last summer only for Arsenal boss Arsene Wenger to reject their overtures. 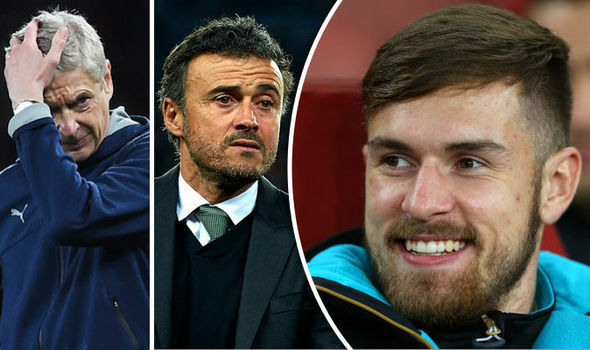 But Express Sport understand from sources close to Ramsey that the Gunners won’t deny the player the opportunity of joining the likes of Lionel Messi, Luis Suarez and Neymar at Barcelona next season. Ramsey is also excited by the chance to play for one of the biggest teams in the world but nothing will be finalised until after next summer’s European Championships in France allowing him to focus on Wales. It’s the principality’s first major tournament since 1958 and includes a mouth watering clash against England. Barcelona know they will have to part with a fee in the region of between £50 million and £60 million but they are fully committed to that in the belief that Ramsey can help them continue the club’s amazing success. Barcelona are amongst the clutch of clubs who also want Everton’s John Stones but while there are plenty of negotiations ahead for that to happen the Ramsey deal is moving ever closer.